Burnley manager Eddie Howe says he will not consider Danny Ings for a first-team return until the player himself decides he is ready to do so. 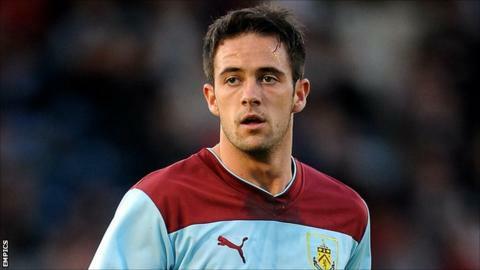 Ings, 20, in pre-season and had expected to be out for the majority of the season. But an operation on the injury was a success and the striker is now back in light training with the Clarets. "We always listen to the player and how they feel. They know their own bodies," Howe told BBC Radio Lancashire. "All I know about Danny is that he'll do all that he can to come back as quickly as he can. He's that type of character. "Very similar to Martin Paterson, we want Danny fit long-term and we want him playing for us week in, week out so we have to manage him properly." Burnley, who on Tuesday, will assess the fitness of captain Jason Shackell and winger Junior Stanislas before Saturday's Championship fixture against Millwall. "It's been relentless for us, which is why we had to rotate a couple of players against Swindon," continued Howe. "With the number of games we have and other Championship clubs not still involved in the competition, it does leave us exposed a little bit. "It was very important we rotated the squad and unfortunately we didn't get the result we wanted, but hopefully a couple of players will be back for Saturday."